Drum Corps International's two new programs, SoundSport and DrumLine Battle, are turning musical competition into a global phenomena and bringing more people onto the "field" than ever before. 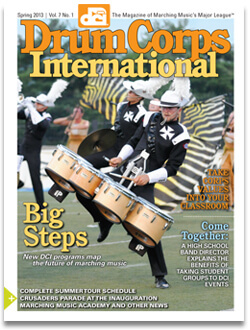 The leader of DCI's popular Kick Start program demonstrates how the teaching techniques used by DCI groups empower and motivate performers. Learn how educators can draw from the drum corps experience to teach their own students to develop the desire to excel from within. Plan your summer by checking out new events, updates, and other highlights from the season ahead. Boston Crusaders help President Obama inaugurate his second term. High school music director Scott Spradling explains why taking his students to a DCI event has become an annual pilgrimage. Madison turns 75 ... The Marching Music Academy for Teachers ... How DCI set a TV composer's career path ... Reliving the classics on Blu-ray, Championships lodging, and more!